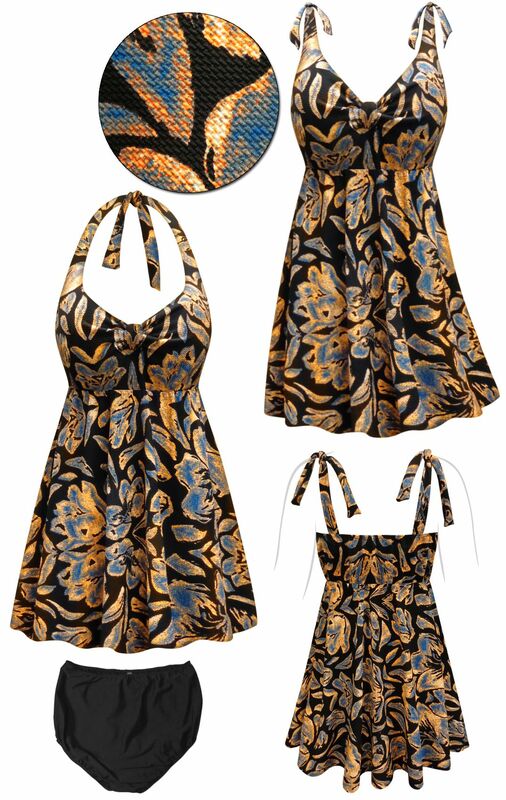 Halter top or straps style plus size & supersize swimsuit (swimdress), elastic at empire waist, extra roomy hips, and they come with either black plain bottoms (bottoms are a separate piece, not connected) or plain swim shorts (for a little extra). There is a shelf bra inside, or you can wear your own bra with it (just take an old bra, unhook or cut the straps from the back, and tie them around your neck under the halter swimsuit). They're nice & long, and usually hit appx mid-thigh, but are available extra long as a special order.